In a chilled medium mixing bowl (I like to stick mine in the refrigerator or freezer for a few minutes) mix together the flour and sugar. Once combined cut in your chilled butter. You can do this process with a food processor to ensure the butter doesn’t get warm too quickly. If the butter starts getting warm, place it in the freezer or refrigerator for a few minutes to firm back up. Whisk together the egg yolk and milk in a separate bowl. Slowly add the egg yolk mixture until the dough comes together. Wrap the dough and chill it in the refrigerator for at least 20 minutes. Roll out the dough thinly and evenly, but wide enough to cover a shallow pie pan with a couple inches of overlap. Chill the dough for another 10- 15 minutes with the almond spread. Thinly slice the plums evenly, then arrange them in bottom of the tart. Make sure to cover the surface completely. I found it easier to make a spiral starting from the center and working my way out. Then filling in the empty spaces. Sprinkle the plums with about 1 tablespoon of sugar, then fold over the over hanging dough onto the plums. Brush the top of the dough with the cream and sprinkle remaining sugar onto the dough. Chill for another 10-15 minutes in the refrigerator. Place chilled prepared tart into the oven for about 45 minutes or until the crust is golden brown. 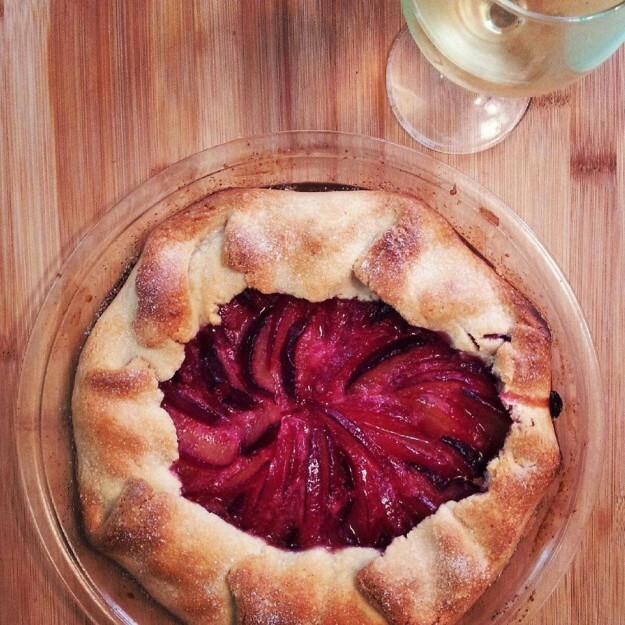 Let the tart cool completely and serve.